One of the most influential and well known jazz artists of his time, William James Basie, popularly known as Count Basie was a self taught pianist. Count Basie not only pioneered jazz music in Kansas City, but influenced the genre of jazz and the broad spectrum of music. Basie and his jazz orchestra played everywhere from Kansas City, to Chicago, to New York City. In the days of his childhood in Red Banks, New Jersey, a young Bill Basie developed an interest in music from a very early age. Although his father was a coachman and his mother a laundress (footnote 1), they both played musical instruments and introduced Bill to instruments early in his life. The first instrument Basie ever owned was a small trap kit his father purchased for him, later deserting the instrument for the piano due to his insecurities of his drumming skills (1). Basie’s developed even more of an interest in music through the Palace Theatre at Red Bank. Bill offered to do chores at the theatre so that he could get in for free (1). 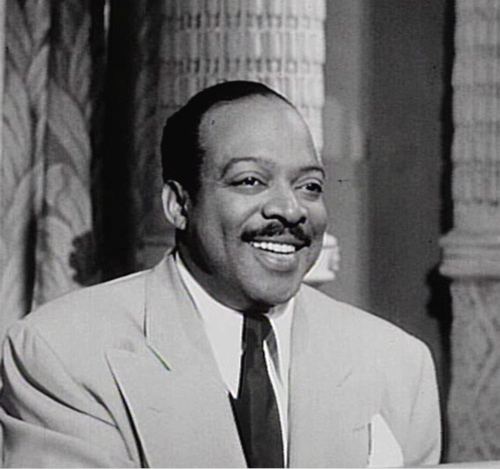 As a young man, Basie moved to New York where he informally studied under James P. Johnson and Fats Waller (2). 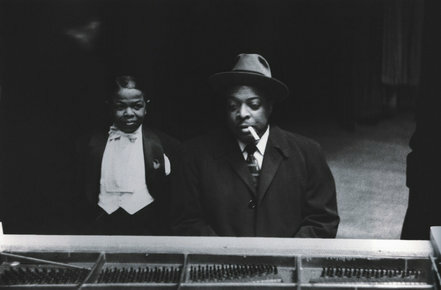 Waller greatly influenced Basie’s piano playing, mostly teaching him organ-playing techniques. Basie’s first professional was accompanying traveling vaudevillian performers, the Katie Crippen and Her Kiddies (3). He then returned to Harlem and auditioned to join Gonzelle White’s band. The band traveled along the TOBA circuit, playing in every major jazz city in the country despite hardships (4 – pg. 79). In 1927, a traveling tour went awry and left Bill Basie stranded in Kansas City. Although Basie had been through the flourishing city before, this marked the beginning of his time spent in Kansas City and one of the most notorious careers of the Golden Age of jazz. At first, Basie found small freelance jobs throughout Kansas City. Having recently declined to join Walter Page’s Blue Devils band in Oklahoma City, Bill sought out the band and went on to join them on the road (4 – pg. 81). Basie officially joined the Blue Devils after a year in Kansas City, working alongside talented musicians such as singer Jimmy Rushing, Oran Page and Henry Smith. Walter Page, eager to challenge the Moten band in Kaycee, changed the bands headquarters from Oklahoma City to Kansas City (4 – pg. 81). With the help of George E. Lee, a well-known bandleader, the Blue Devils opened at the Paseo Hall on October 28th, 1928. The band was immediately well received, the crowd yearning for another song as soon as one ended. Although pleasing, the band’s success was not enough for Basie, his eye fixed on joining Bennie Moten’s organization (4 – pg. 94). Bill left the Blue Devils in early 1929. 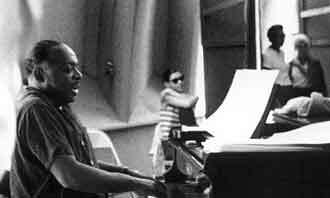 Basie joined up with Eddie Durham, Basie playing the piano as Durham wrote down the melodies on sheet music. Moten and his band were impressed by the music and invited Basie to accompany their band to Kansas (4 – pg. 95). Soon after, Basie became the band’s main pianist and went on to take Moten’s spot as bandleader. Basie became Count Basie as he led Count Basie and his Cherry Blossom Orchestra. Basie went back to work with Bennie Moten up until the year of Moten’s death in 1935. After Moten’s death, Basie put together the Barons of Rhythm, a band with members from both the Blue Devils and the Moten band. Count Basie and His Barons of Rhythm established themselves through a lively relationship with the Reno Club in Kansas City and developed a wide audience through nation-wide radio broadcasts. After Kansas City, Basie went on to play in New York exposing him to a much wider audience. In New York, Basie played at venues such as The Savoy and the Roseland Ballroom. Basie even played with artists such as Billie Holiday and Benny Goodman. In 1984, Count Basie died of pancreatic cancer at the age of 79. His influence lives on with the contemporary music of today and the streets of 18th and Vine.